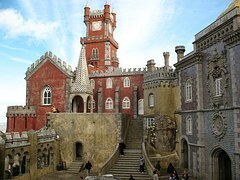 When I first looked at the photos of the town’s Pena Palace online, it looked like something from a fairy tale. With its yellow and pink turrets and towers, and the fact that it was set on the top of a mountain with a long, windy road leading up, I imagined that Rapunzel might be holed up in there, waiting for a dashing suitor to let her hair down for. 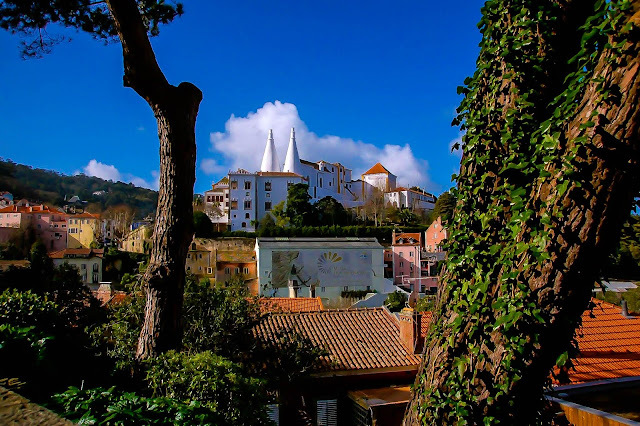 As well as the hilltop palace, there is a beautiful town centre, with lots of little cafés and quirky stores; a Moorish Castle (Castelo dos Mouros); Sintra National Palace; Sintra Mountains AND Sintra-Cascais National Park. On top of that, the area is also designated as a UNESCO World Heritage Site. You can’t ask for more than that, can you? Exactly. The town also has the most wonderful winding road that snakes through the mountain side and leads you up to the jewel in Sintra’s crown: Pena Palace. In amongst these gems are other estates and buildings, all of which blend in superbly with the surrounding hillside. Sintra’s train station is around 1km from the town centre, but even the walk from here to the town proper is picturesque and the atmosphere on our arrival was one of anticipation at what was in store for the day. 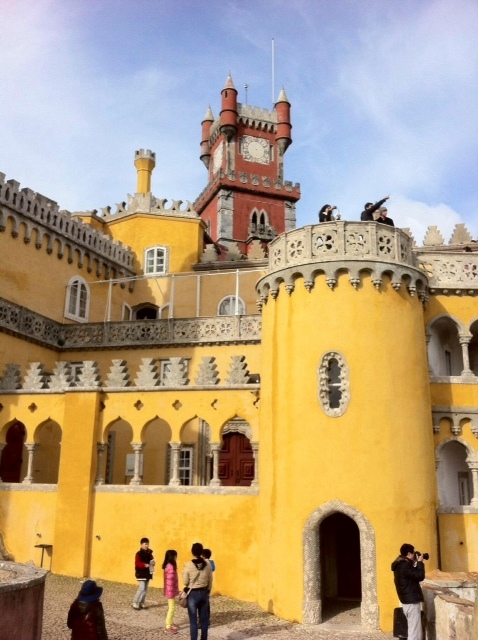 Sintra’s train route is the most congested in Europe, as is the road network between the capital and the town. That gives you some sense of how popular the area is. For once, despite the prospect of the walk/hike we had in store for the day, I was really excited about the prospect. And that’s not my normal response when faced with a day of climbing. Also, I knew they sold beer in the main town, so I could sit and rest my weary legs later in the evening. The town of Sintra is as colourful as the Palace, with the main square of Sao Martinho housing Sintra National Palace in addition to a lovely mix of cafés and stores. It's a charming and historic town, nestled in the foothills of the Sintra de Terra Mountain range and has long been a popular retreat of royalty. Although not as famous as some of the other sights at Sintra, there is much to see and do here that doesn’t involve the National Palace. For example, the glorious Monserrate Seteais Palace (which is now a luxury hotel) are equally picturesque and worthy of some gawking. I particularly enjoyed working out what on earth was being represented by some of the large sculptures at the side of the road into town. I didn’t know then and I’m still clueless, tbh. They were very pretty, though. This is largely due to the fact that it was so well used for such a long period of time, meaning that it was also very well maintained. After parting with around 8.5 Euros, you can wander around the palace at your leisure, checking out the interior of the gorgeous white washed structure. Some of the highlights, for me, were working out just what the two massive chimneys were for that I could see from the road (they’re from the Vista de Cozinha or kitchen), as well as the opulent Swans Hall and Magpie and Arab Rooms. We visited the Palace in February, so it wasn’t uncomfortably busy and this ensured we weren’t vying for all the good views. Also: it meant we could take lots of stupid posed photographs without enduring quite so many odd looks. Portugal is world famous for tile and, once you check out the decoration on display at the Palace, you will immediately see why. It’s really outstanding and that makes it all the more difficult not to run your hands over it. 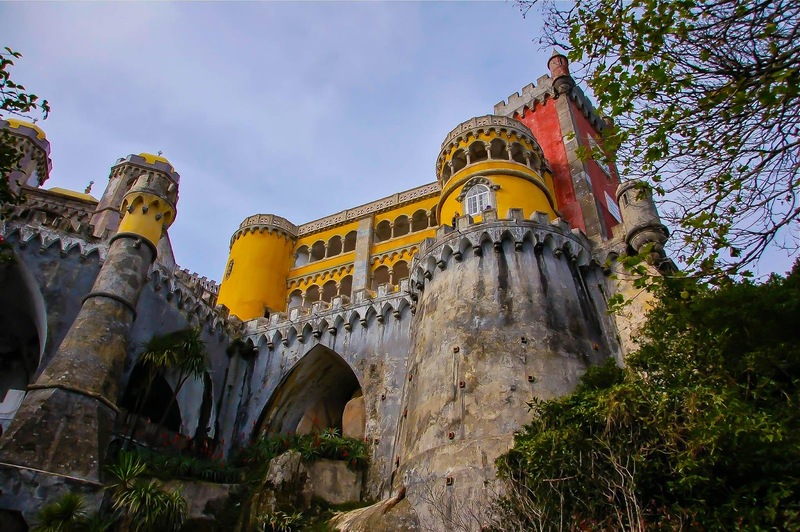 The Moorish Castle sits on a hilltop in the Sintra Mountains and is at the end of a pretty long walk up a very steep, winding hill. It is worth the effort, though. The North Face of the Castle offers unrivalled views of the valley below its location was key in ensuring the safety of the area and its people from marauding armies. Plus, to be honest, if you led your guys all the way up that hill, the chances of you having enough energy left to fight were slim and none. Honestly – it’s knackering – and that was winter. I can’t begin to imagine visiting in the height of summer. The castle was built in the 8th and 9th Century during the Muslim occupation of the area and this is very much reflected in the appearance. 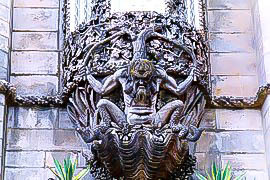 It is well preserved, but nowhere near the condition of the National Palace of Pena. Today, the Castle remains and has been added to somewhat with the addition of wooden panels, which actually fit really well with the original solid stone building. You can wander around the site and visit the Chapel, before taking time out to walk along the outer walls and marvel at the view. The National Palace was the summer residence for the Portuguese Royal Family in the 18th and 19th Century and was constructed on the 16th Century remains of The Order of Jerome Monastery, which might well account for its remote and peaceful location. I don’t know of many city centre Monasteries. 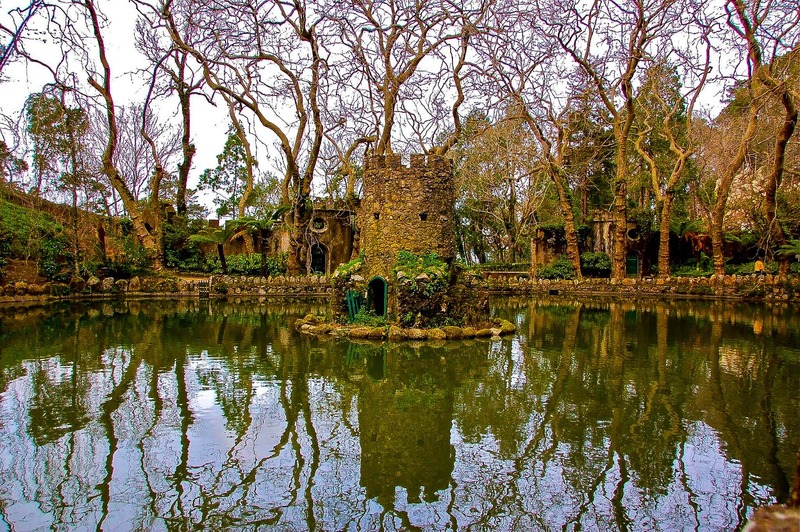 It is also one of the Seven Wonders of Portugal and an UNESCO World Heritage site in its own right. It’s difficult to describe just how surreal the palace looks on approach and, as I said earlier, it’s reminiscent of something from a fairy tale. Apart from the design and construction, the different colours of the exterior serve to make it all the more special. The interior is equally impressive, and as with the Moorish Castle, the views from the turrets are outstanding. On a clear day, the views are breath taking and when your walk ends high in the mountains, at least you know getting back down won’t be half as difficult. If you can manage it, it’s a great experience and there’s so much to see on the way up the mountain. It is very steep in parts, though, so do be mindful of it on your way up. On the way down, you can console yourself, as I did, with the knowledge that there’s a plentiful supply of red wine in Sintra town, just awaiting your arrival. It’s amazing how much more energy you can suddenly muster up when you know you’re only half a mile from the nearest bar….